If a noise gate is a necessity in your signal chain, this one offers real versatility. Noise gatescan be lifesavers if you have a rig bedevilled by an excess of unwanted noise - be that low-frequency hum from single-coil pickups or earthing issues, or unwanted hiss from a massively cranked amp or dirt pedal. band gating that can zero in on specific frequencies for a perhaps more natural noise-reduction experience. With knobs to set the amount of noise attenuation and the rate at which the gate closes, there's plenty that can be achieved with those two presets, but for really zeroing in on the exact noise reduction needed, the TonePrint facility lets you finely edit your gate's characteristics. 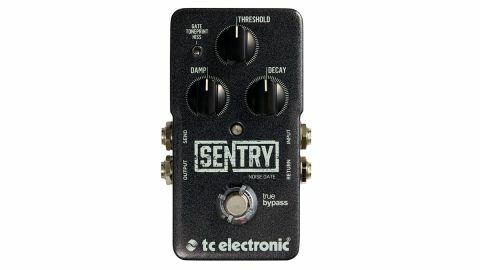 What's more, send and return jacks let you use it solely, say, on a noisy high-gain distortion pedal to set up gating that works very naturally, the gate being triggered by the direct guitar signal, but closed after the noisy pedal.